Hello, all. I am currently working on a new game called Text Dungeon, a first-person adventure RPG about going through a seemingly endless dungeon, and it is going pretty smoothly. I have some plans, although unimplemented, like enemies, bosses, chests with random loot, and more. I thought I'd post about this to get feedback/opinions/suggestions on the idea. Let me know what you think, and thanks for reading! It's a very good idea, on wich calc do you plan to write it ? Can you give us some more information about it? Is is a text RPG or an RPG with text graphics? Home screen or graph screen? Will it actually be an endless dungeon or will there be an ending? Will there be floors where you can travel back to different rooms or will it be a game where you can only progress forward? How will you store the room data? How will you handle enemies and player weapons? Hi, It's a very good idea, on wich calc do you plan to write it ? I plan on it being on the TI-84 Plus CE. Sure thing! 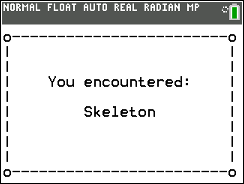 It is an RPG with text graphics on the home screen. It will probably have an ending, although it will take MANY rooms to get to it, alluring to "seemingly" endless. You can only progress forward and room generation is mostly random, with a bit of predictability. The room data will be based on a variable that goes up with every room you go through. I plan on the enemies being a separate encounter from the game, opening an RPG-style fight (hopefully). Weapons and equipment will increase basic stats like health and attack. I hope this gave you some insight! You can only progress forward and room generation is mostly random, with a bit of predictability. The room data will be based on a variable that goes up with every room you go through. I was developing a Ti-BASIC RPG that had rogue like elements, that used an X/Y grid for room generation. 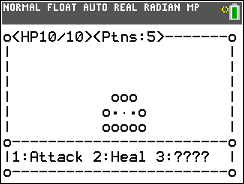 The game used the X/Y coordinate as a seed for a pseudorandom algorithm to generate a ten digit number, and used that for determining the room's characteristics (Such as taking the last digit to determine the room type, and the fourth digit for determining the enemies). Using an algorithm based off of the X/Y of a room made it so that each room would stay the same. For randomization, it used a combination of squaring, subtracting, and culling unneeded digits. A similar process can be done in assembly, and is rather easier due to having bit testing at your disposal. Making an interesting and worthwhile RPG is incredibly hard, as it is difficult to make combat more that "spam your best moves until the opponent is dead". I attempted to use a focus on status conditions and reactive and interactive combat to avoid this, but I'm curious what you'll come up with. Working on: Programming a graphics routine that will likely spontaneously combust. Thank you! I'm trying my best to make this game interesting, and I do want to do something a little unique with the combat system, but I don't want that to make what this game is about, since it's mainly about going through the dungeon itself. That being said, I still do want to experiment with things I can do. Hello all! I come bringing an update! I finished most of the coding with the menus, so next I'm going to start working on how loot works, and after that, enemies. So, I thought that what better way to show off something you're working on than with pictures, right? So, here's a little taste of the game so far! This is all for now, but keep a lookout for updates in the future! This is fantastic! The graphics look awesome! Do you have any animated screenshots by any chance? This is ascii art ! 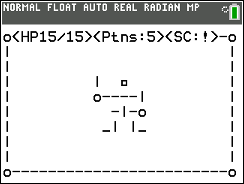 There are free software to transform a picture in ascii art. If you want to show a picture it could help you. Thanks for that suggestion! I'll be sure to try that. I don't, but there isn't really much "animation" other than rooms being cleared then new ones being output. There will be more screenshots, though! I'm probably not going to convert real images, I like doing it by hand. Or, by keyboard. Whew, it's been a while since the last post, huh? Sorry about that, school work is taking up a bit of my time, so updates won't be too frequent. That being said, however, I come with another progress update! To start this off, thanks tr1p1ea for the idea of changing the "D" on the title! It looks much better, now. 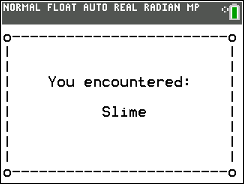 Next, I've basically gotten the whole item system down. You'll be able to check your equipment to see what you have, as well as basic descriptions for your gear. Finally, I'd like to show off and explain the chest system. Most items you acquire will be found in a chest, which requires a key to open. So far, keys can only be found randomly, but there may be more ways to get them in the future. As for the items you find, the better they are, the rarer they are, so it may take a lot of keys before you get the real good stuff. That's all for this update! I'm glad I finally got this one out. As for the future of the game, I hope to next add shops, then the fighting system. After that, I should hopefully be on the play testing phase of development. Until then, keep a look out for the next update! Hey, guys! With this update, I'm almost done with the shops, and will get on to the battle system soon after. Unfortunately, I don't have images to share about the shops, but that's not what this update is for. So, I've been wondering about if I should do fights on the home screen or graph screen. Then I thought, I could just get your guys' opinions. So, where would you rather see fights on, the home screen or graph screen? Thank you PixelPerfect to ask our opinion. Graphics do not necessarily have to be slow. An upcoming project of mine (as always, don't interrupt the on-topic thread with off-topic project anticipation) uses stick figures, and the animation is really smooth as long as you are clever. I'd say that good homescreen graphics are harder to program because of the low resolution. And because you don't need to store all kinds of strings, I'd imagine that many things like Line( and Circle that we take for granted end up as large strings. Your above text-based graphics are amazing and I want more. Now, I did forget to mention something about if I were to do graph screen graphics. I would make it, for the most part, text-based. So, it'd just be like the home screen, just with a higher resolution and the possibility of colors. With that being said, feel free to tell me what you think of that idea. Hello, again! I hope everyone had a safe Halloween. I come with a treat, so please enjoy. A while back, I was debating whether or not to have fights take place on the home screen or the graph screen. After a bit of testing, I decided to make the fights on the home screen. Ever since, I have been working on the fights, and I have a few screenshots to show. As of this update, I have finished all the other enemies in the game, and am starting to work on bosses. After that, I'll be testing the game, maybe with a few other friends. That means that the release is growing ever-closer, and I'm really excited to be this far. Until then! Thank you for these good news i hope to play your game asap. Concerning Halloween, except in Paris, it's not a big celebration in France, it's more commercial, not family. I encounter some zombies, werewolf and vampires but i told them to return inside your rpg game. Time for another update! I don't have any images to show, but I do have progress to share. I'm basically done with main development and am on the "major testing phase". What I'm probably going to do is get some help from friends to speed up the testing process. That being said, I'm excited to say that the release is coming pretty close. I don't have a date or anything (I'm not that organized), but keep your eyes open for the next update. Until then! There are 152 users online: 5 members and 147 guests. © Copyright 2000-2019 Cemetech & Christopher Mitchell :: Page Execution Time: 0.471568 seconds.